BWC has had a long illustrious history with Planetside 2. With that being said it was almost time to pull the plug on the game that allowed BWC to grow to prominence. Planetside 2 has a long history being released November 20, 2012 and still continuing to this day. Prior to Planetside 2, BWC was pushing the meta in the original Planetside. There are many reasons that could be labeled for the lower participation within Planetside 2. There are meta changes, content issues, and other aspects that could create a problem for BWC. Yet, when it was time to pull the plug on this storied game out of the ashes comes Asterix85. Asterix85 put up the big middle finger to killing off Planetside 2. He is also fighting the current Planetside2 meta by bringing vehicle combat back to what is now considered a "meat grinder". Recruiting has picked up, ops are being played constantly, and trainings are being taught to keep that razor's edge within Planetside 2. Asterix85's main focus is bringing vehicle combat back to PS2 and creating a fun environment to play in. There is also a shout out to Evans who continuously keeps everyone updated on PS2 ops, events, and details. Asterix85 has made PS2 a Phoenix rising out of the ashes of what was thought to be a dead game. Many are called, but few are capable of doing what Asterix85 has done with this game. We look upon the future of PS2 with great earnest with him at the helm. If you would like to join in the slaughter of massive scale battles with vehicle combat, jump into the PS2 channels every Tuesday and Friday. If you need any information on how to play PS2 there are also trainings readily available to help you get your feet wet and understand what to do in the grand scale of battle. PlanetSide 2 is a supported game regiment and offers all BWC members a great opportunity for quality gaming, team building and event participation. Featuring tactical variety, fun and engaging gameplay mixed with competitive elements, PS2 espouses the “One Team, One Fight” ethos that BWC centers itself upon perfectly. Forsaken, the latest expansion for Destiny 2 is upon us. This is a massive expansion that the developers from Bungie are planning to change and build Destiny 2 in a new and greater direction. First of all, Forsaken is taking us Guardians in a more personal direction by killing are favorite and most beloved Vanguard in Cayde-6. This is going away from the old version of new enemy for x reason to a completely vengeance driven direction. Old allies are becoming enemies and aligning themselves with enemies for unknown reasons. It is time to go back to the Reef and avenge are beloved Cayde-6 and put the smack down the Barons that killed him. We will explore and see places that are sacred to the Awakened. Hunt down new enemies that are up to nefarious means and provide assistance to those in need. Prepare yourself Guardian for Forsaken is here. Bungie has learned vastly with runs of Destiny and Destiny 2. Destiny The Taken King expansion was considered one of the best releases of the franchise. They changed directions with Destiny 2 to explore the usage of new technologies and game play. With all the data collected, Bungie planned Destiny 2 Forsaken to be the best of both worlds. 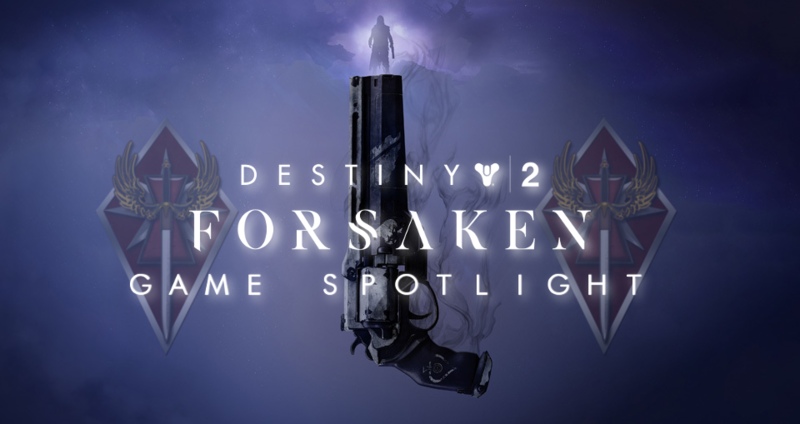 Destiny 2 Forsaken is an addition to a very good shooter based game expanding all platforms. Forsaken also known as Year 2 is changing the way how content drops will occur also. Free content drops will be done seasonally with different modes and objectives being added and taken away. The Annual Pass will provide permanent content drops that involve content such as new raids, rewards, triumphs, exotics, and access to certain events. There will also be more festivals based on holidays. There are many pros and cons to this expansion, but the pros far out level the cons in this regard. Grimoire Cards are back. These were a product of Destiny 1 that gave huge amounts of information to the lore of Destiny. The new story coming into Destiny is more personal and dark in some ways. It brings real feeling to what you are doing in the Destiny Universe. There is a more diverse weapon ecosystem allowing players to actually play the way they want to especially with the addition of bows and other weapon types. Armor visuals have been vastly improved and the overall area graphically is gorgeous. No longer are raids gimmicky mechanics and a single boss. They are taking the pages of World of Warcraft and actually having full raid tiers with multiple boss landscapes. Enemy visuals and design are improved. No recolors of old enemies, but new models and graphics. Due to new variants in modifications, the game will have a more mmo style grind. Yet, this grind will not be as harsh as many mmo's. Future updates will be gated behind an Annual Pass. This pass is $30. To buy the game now with all current content and the Annual Pass is $100. This includes Destiny 2 base game, Curse of Osiris expansion, Warmind expansion, and the Forsaken expansion. Weapon types are no longer locked to certain ammo types. Some shotguns, snipers, fusion rifles, and grenade launchers have been moved from heavy ammo type to kinetic and energy weapons. This gives more options to players to kit out the way they so choose. If a player chooses to play with three sniper rifles they can. They can also use multiple energy weapons. Ammo distribution has changed to prevent a kit from being to strong. If you do choose to go with two energy weapons on top of a heavy it will be slightly more difficult to gain ammunition for the two energy weapons compared to someone with a kinetic and energy weapon. This is a way to keep balance. Enhancements will no longer have a numerical value. Also enhancements will be completely changing as with weapons. Weapons will have a random mod attached. For example a Better Devils can be completely different from another Better Devils due to the given mod. When weapons are melted the player is also able to keep the mod to potentially change the playstyle of another weapon. Masterworks now have a ten step procedure. Weapons and Armor will gain points in secondary stats as it is "leveled" to masterwork. As soon as the weapon is masterworked it will gain all stats that were pumped in plus a flat gain. For example a masterwork progression may give a weapon additional stability. As you masterwork level it will increase the stability by 1. As soon as the weapon is masterworked it will gain a significant gain to the stability stat. Every class and spec will be gaining a new Super. These supers are to change game play styles so that players can stay in the same spec. Examples: Arcstrider Hunter will now be able to deflect shots during super. Dawnblade Warlocks will be able to conjure a bubble that acts as a better healing and empowering rift. Sunbreaker Titans are getting a two handed hammer that creates a massiver fiery tornado of death to do their damage. All nine specs will be getting an additional Super and all of them are amazing and different to the specs they are aligned with. With every expansion in Destiny comes new weapons and Exotics. This time they are adding "NEW" weapons and exotics. Not the same hand cannons and rifles that have different flair. Destiny 2 Forsaken is adding different weapon types such as Bows and other weapon types. Some Exotics from Destiny 1 are making a comeback with new exotics added to change play styles. How about a trace rifle that has an ebb and flow to how it fires? Well this is coming to Destiny 2 Forsaken. PvE and PvP finally got together and produced this beautiful baby. Gambit is a mixed PvPvE mode that involves killing adds to collect shards to produce a boss. Both teams are working on the same objective in different areas. With the use of these shards a team can add more difficult mobs over to the other team to slow them down. At the same time players can also take a portal to harass and kill the enemy team. Killing an enemy player in this mode will make them either lose shards or give health back to the boss when it is up. First team to kill off their boss wins. So even if you are not a PvP wizard or PvE god, you will still be able to play in a mode that contributes. Tangled Shore is part of the reef that was explored in Destiny 1. Tangled Shore is the main city of the Awakened a class of humanoid in the Destiny universe. It also includes the Dreaming City the most precious area of the Awakened where the new raid Last Wish will occur. The visuals are beautiful and design of the Tangled Shore is gorgeous to the point where players will want to stop and take it in. Destiny 2 is a supported game company and offers all BWC members a great opportunity for quality gaming, team building and event participation. Featuring raids, public events, strikes, and fun and engaging gameplay mixed with competitive elements, Destiny 2 espouses the “One Team, One Fight” ethos that BWC centers itself upon perfectly. All times are GMT-5. This page was generated at 00:37.